It was a fine Spring morning and the market was alive early today with gardeners, like myself, gathering new plants as preparation for a day’s work in the domestic gardens of East London. Although I already have some in a variety of colours, I could not resist the blue of this Aquilegia for a mere £2. The compelling artificiality of their elaborate flowers, like some strange medieval bonnet, or pleated skirt, or even an eccentric semi-folded umbrella, contrast elegantly with their modest delicately shaped grey green leaves. I was brought up to call them Columbine and we had them growing wild in every corner of our garden in Devon, and when my father died they took over his vegetable patch between the orchard and the flower garden to create their own shimmering display of colour each Spring. Then, years later, when I set out to walk the length of the Pyrenees from the Atlantic to the Mediterranean coast, I found Columbine growing wild to fill entire mountainsides with their blooms, in the Basque country. 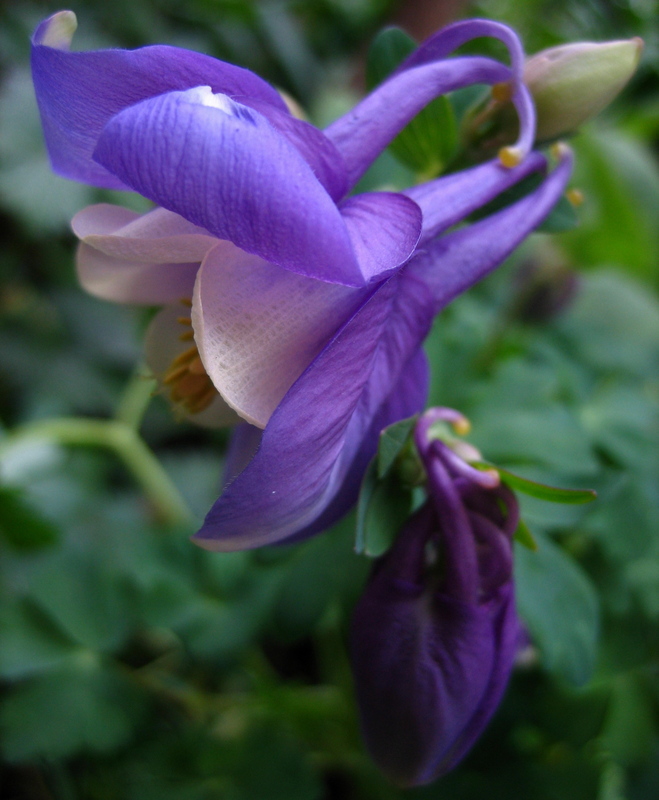 The wild variety were of the deepest blue, and that was what I recalled when I came upon this Columbine this morning. This week, for the first time, plants that I bought last year in Columbia Rd have come into flower in my garden. 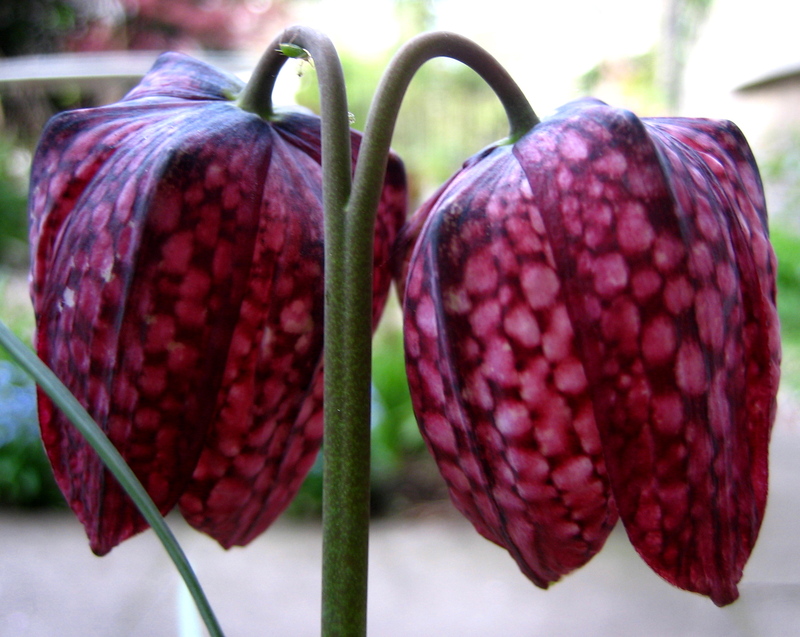 I am especially proud of the Snake’s Head Lilies (Fritillaria Meleagris), that I grew from bulbs, because in the past I have failed to cultivate them. 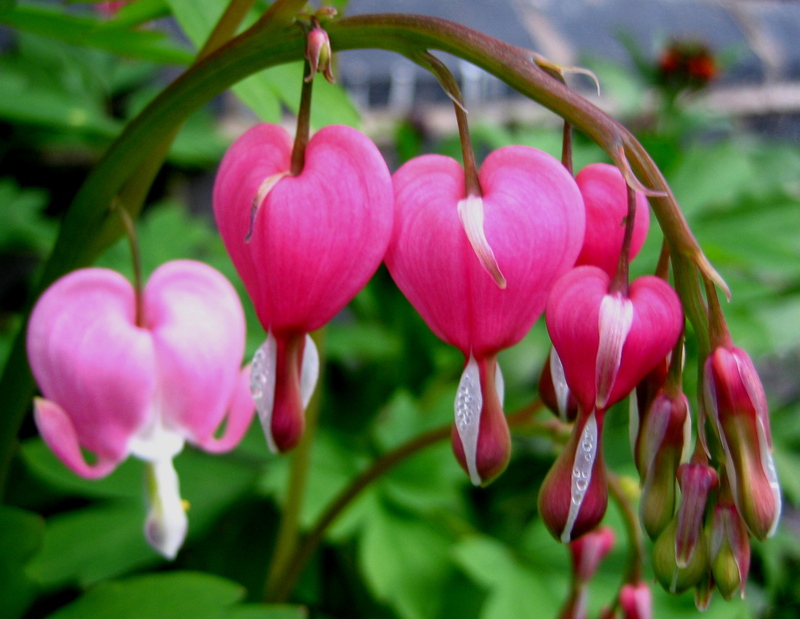 Also, the Bleeding Heart (Dicentra Spectabilis) which I bought for £3 is now a huge fleshy pale green plant hung with its flowers that vividly resemble hearts with tear drops emanating. I know these are considered unfashionable now, with a white variety replacing the pink, but if you can get past the overcooked nineteenth century allegorical quality, they are extraordinarily beautiful. Three commonplace yet bizarre flowers this week, each so intricate in their composition and design, each illustrating the endless ingenuity of nature. Oh my your flowers look beautiful! Don’t you just love this time of year? Yesterday I took the pots out of the shed, worked on my lavander and read some Beverley Nichols. I can’t wait until it warms and I can really start working. Please consider telling us more about that walk along the Pyrenees.